President Muhammadu Buhari has solemnly criticized the brutal activities of the deadly Boko Haram insurgent sect. President Muhammadu Buhari on Thursday night reassured that the brutal activities of the Boko Haram sect would soon become history, NAN reports. He, therefore, urged them to use their platforms in the social media in promoting the achievements of the Buhari administration. 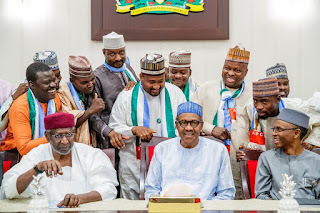 Mustapha thanked entertainers for the roles they played in 2015 which contributed immensely to the victory of Buhari in the presidential election, and called on them to repeat the same in 2019. The News Agency of Nigeria (NAN) reports that Gov. Nasiru el-Rufai of Kaduna state and his counterpart of Plateau, Simon Lalong as well as presidential aides were among the personalities that attended the event.